The present research project was approved (2018/08) by the Ethical Committee of Selcuk University, Dentistry Faculty of Konya. Digital dental panoramic radiographs of 4263 individuals who had visited the dentistry faculty of Selcuk University for routine dental procedures approximately in a 2-year period, between January 2017 and October 2018 were included in this study. The images in bad diagnostic quality, lack of clarity, and the presence of wide pathologic lesions or maxillofacial operations in the related area were excluded from the study. All the images were obtained with Kodak 8000 Digital Panoramic Dental X-ray System (Carestream Health Inc., Rochester, NY, USA) and evaluated by an oral and maxillofacial radiologist. Calcifications were interpreted according to the site, distribution, number, shape, and appearance on full screen according to the criteria shown in [Table 1]. The interested regions on panoramic radiographs were inferior border of the mandibular body, posterior border of the ramus, mandibular angle, and anterior border of the cervical spine. A total of 270 (6.4%) calcifications were detected in all the evaluated images, of which 150 were females and 120 were males. The calcifications seen on the images were compatible with tonsilloliths, calcified lymph nodes, carotid artery calcifications, and sialoliths [Figure 1]. The mean age of the individuals with calcification was 40.37 ± 14.77 and without calcification was 27.44 ± 15.85 [Figure 2]. There was a significant difference with regard to the age between individuals with and without calcifications and also for all calcification types (P ≤ 0.001), and there was no significant difference between genders with regard to the presence of calcification (P = 0.666). However, the difference of calcification types between the genders was significant (P ≤ 0.01). The distribution of the calcifications according to gender is shown in [Table 2]. 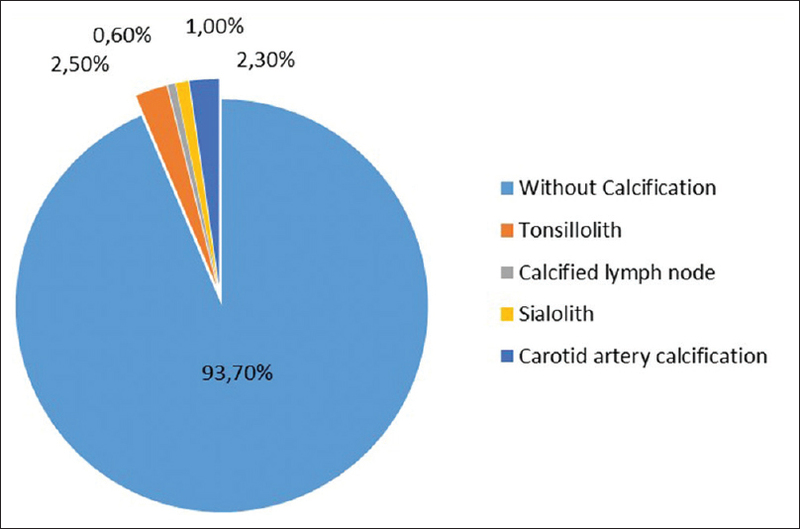 In the present study, mostly detected soft tissue calcification was tonsillolith followed by carotid artery calcification, sialolith, and calcified lymph node [Figure 3]. Monsour PA, Romaniuk K, Hutchings RD. Soft tissue calcifications in the differential diagnosis of opacities superimposed over the mandible by dental panoramic radiography. Aust Dent J 1991;36:94-101. Noffke CE, Raubenheimer EJ, Chabikuli NJ. Radiopacities in soft tissue on dental radiographs: Diagnostic considerations. South Afr Dent J 2015;70:53-9. Vengalath J, Puttabuddi JH, Rajkumar B, Shivakumar GC. Prevalence of soft tissue calcifications on digital panoramic radiographs: A retrospective study. J Indian Acad Oral Med Radiol 2014;26:385-9. Ramadurai J, Umamaheswari TN. Prevalence of maxillofacial soft tissue calcifications in dental panoramic radiography: A retrospective study. IP Int J Maxillofac Imaging 2018;4:82-6. Garay I, Netto HD, Olate S. Soft tissue calcified in mandibular angle area observed by means of panoramic radiography. Int J Clin Exp Med 2014;7:51-6. Alves N, Deana NF, Garay I. Detection of common carotid artery calcifications on panoramic radiographs: Prevalence and reliability. Int J Clin Exp Med 2014;7:1931-9. Carter LC. Soft tissue calcification and ossification. In: White SC, Pharaoh MJ, editors. Oral Radiology: Principles and Interpretation. St. Louis, MO: Mosby Elsevier; 2009. p. 526-40. Tortorich J, Woods M, Shintaku W, Anderson KM. Diagnostic considerations of calcified lymph nodes. J Tenn Dent Assoc 2013;93:8-10. Nasseh I, Sokhn S, Noujeim M, Aoun G. Considerations in detecting soft tissue calcifications on panoramic radiography. J Int Oral Health 2016;8:742-6. 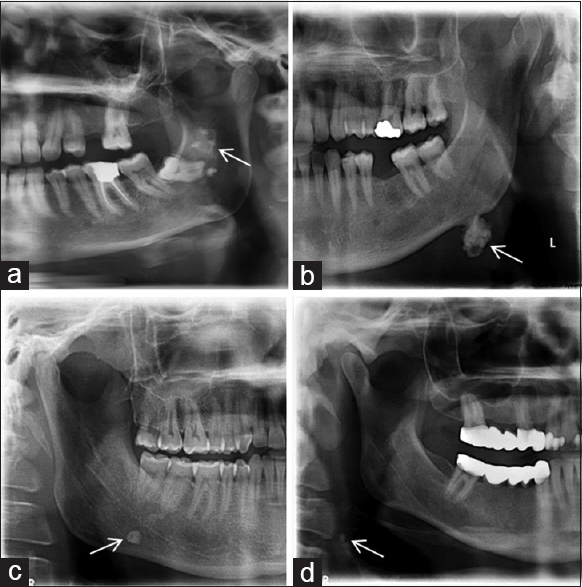 Omami G. Soft tissue calcification in oral and maxillofacial imaging: A pictorial review. Int J Dent Oral Sci 2016;3:219-24. 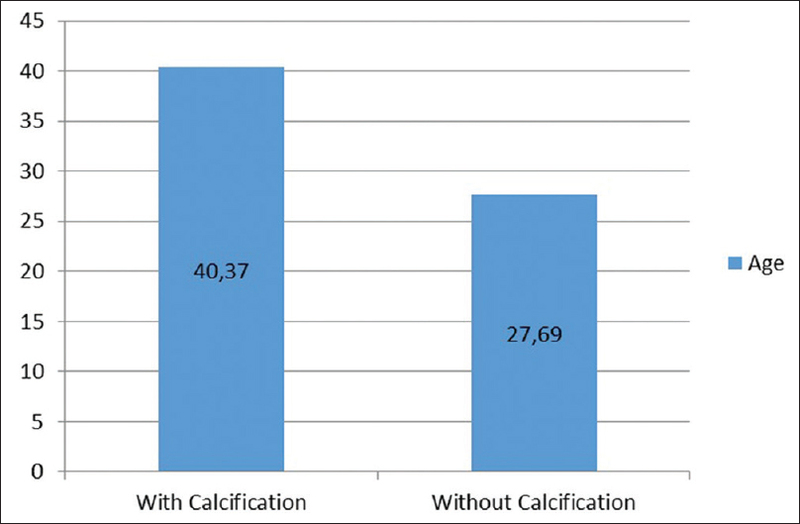 Bamgbose BO, Ruprecht A, Hellstein J, Timmons S, Qian F. The prevalence of tonsilloliths and other soft tissue calcifications in patients attending oral and maxillofacial radiology clinic of the university of Iowa. ISRN Dent 2014;2014:839635. Ribeiro A, Keat R, Khalid S, Ariyaratnam S, Makwana M, do Pranto M, et al. Prevalence of calcifications in soft tissues visible on a dental pantomogram: A retrospective analysis. J Stomatol Oral Maxillofac Surg 2018;119:369-74. Mandel L. Multiple bilateral tonsilloliths: case report. J Oral Maxillofac Surg 2008; 66:148-150.
de Moura MD, Madureira DF, Noman-Ferreira LC, Abdo EN, de Aguiar EG, Freire AR, et al. Tonsillolith: A report of three clinical cases. Med Oral Patol Oral Cir Bucal 2007;12:E130-3. Babu BB, Tejasvi ML, Avinash CK, Chittaranjan B. Tonsillolith: A panoramic radiograph presentation. J Clin Diagn Res 2013;7:2378-9. Bayer S, Helfgen EH, Bös C, Kraus D, Enkling N, Mues S, et al. Prevalence of findings compatible with carotid artery calcifications on dental panoramic radiographs. Clin Oral Investig 2011;15:563-9. Santos JM, Soares GC, Alves AP, Kurita LM, Silva PG, Costa FW, et al. Prevalence of carotid artery calcifications among 2,500 digital panoramic radiographs of an adult Brazilian population. Med Oral Patol Oral Cir Bucal 2018;23:e256-e261. El Deeb M, Holte N, Gorlin RJ. Submandibular salivary gland sialoliths perforated through the oral floor. Oral Surg Oral Med Oral Pathol 1981;51:134-9. Avignon S, Foletti JM, Collet C, Guyot L, Chossegros C. Calcifications of the parotid space. A review. J Stomatol Oral Maxillofac Surg 2017;118:167-72. Jha BC, Dass A, Nagarkar NM, Gupta R, Singhal S. Cervical tuberculous lymphadenopathy: Changing clinical pattern and concepts in management. Postgrad Med J 2001;77:185-7. Kamala KA, Sanketthguddad S, Nayak AG, Sanade AR. Submandibular lymph node calcification – A diagnostic dilemma. Br J Med Health Res 2017;4:1-7.